Perhaps the most controversial genre I collect is post-mortem photography. The unsuspecting who come to my apartment and see an item such as the one shown above...well, let's just say people seem to find it somehow "inappropriate." I'm not sure what's so inappropriate about post-mortem photography. Perhaps, the people who have that reaction don't understand it. Perhaps, the notion of a dead child is just too disturbing for them to bear. It points to our own fragility as mortals-- even children can die-- none of us are safe. Perhaps, people then were more comfortable with death-- it wasn't as taboo-- because mortality rates were higher. In the 1840's when people began getting their photographs taken, it was an expensive affair. People took it very seriously, as such, and were very formal in their poses, expressions, and dress. Many people would only afford to have one photo taken of themselves in their lifetimes. In the case of children and infants with high mortality rates, parents often had no photographs of them from before they died. This is very different from today, when parents can begin taking hundreds of digital photographs as soon as the slimy, little thing emerges from the birth canal. Given the lack of photographs taken in life, parents in the 19th century began having their children's photographs taken in death. Adult post-mortem photographs were also taken, but this was less common. The photographs would serve as a memorial to their loved ones. Something to remember them by. Thanks so much for explaining why children's post-mortem portraits are more common than adults... I was wondering why I mostly came across children. I'm doing an essay for school about post-mortem portraits, and post-mortem photography is one of them. I'm also taking deathmasks in the post-mortem portraits.. 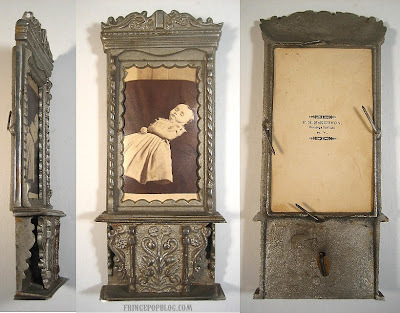 I was wondering if you knew some sites about post-mortem photography cause I find it hard to find different pictures about it. P.S. I bookmark this blog entry, so if you can comment on it, I will read it... Thanks again! Glad to help. Sounds like an interesting project. Another good place to look for images is eBay or through a Google image search. Those will give you a lot of samples. For information, rather than photos, there's a few books on post mortem photography that you can find on amazon that provide good info. Thanks a lot, especially for the Paul Frecker site, it has a lot of pages with pictures! This will definitely help me with my essay! Awesome. Hope you do well! go to Google images and type in "Victorian post mortem" and all the sites will pop up in front of you. hope this helps. I promised to tell you what I got for it... and I got a 9, out of 10! So thanks a lot for your help!